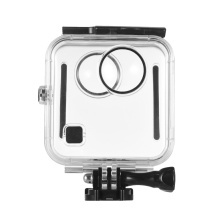 Camera waterproof housing specially designed for GoPro Fusion action camera. Waterproof depth is up to 40m, ideal for diving, surfing, snorkeling and other water sports. Comes with standard mounting bracket, easy to connect with other action accessories.